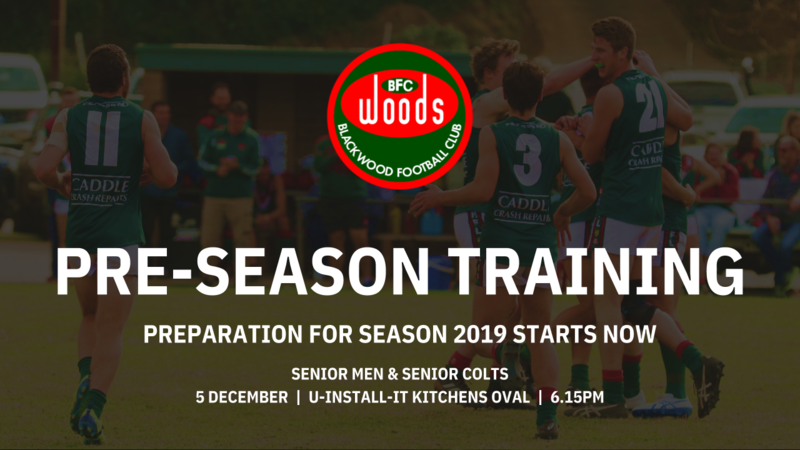 A new era at the Blackwood Football Club is set to begin on Wednesday December 5 2018 at U-Install-It Kitchens Oval when pre-season for the senior mens and senior colts teams commences under the guidance of new Senior Coach Ryan Anderson. The Anderson era will have a different feel with Steve Woods taking over as Strength and Conditioning coach whilst Matt Thomas will step into the A-Grade assistant role after three seasons at the helm of the Senior Colts. Training will commence at 6.15pm sharp with players expected to be in attendance early to prepare for the session. There will then be two additional training sessions on the 11th and 13th of December before resuming on Tuesday the 15th of January 2019.